It’s been quiet for a while on the blog and that’s mainly been due to some very poor photos, some disappointing projects and a bit of quiet on the crafting front as I try working on a couple of larger projects to try and reduce some stash. To make up for it, here’s a fairly old project (about a year) that I never seemed to get round to posting and a fairly new project (about a month). First, the fairly old. 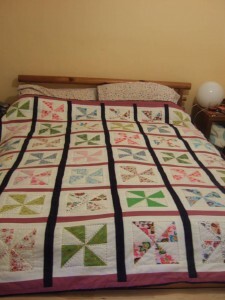 This quilt was made as a wedding present for my best friend last year. It’s my first proper quilt. 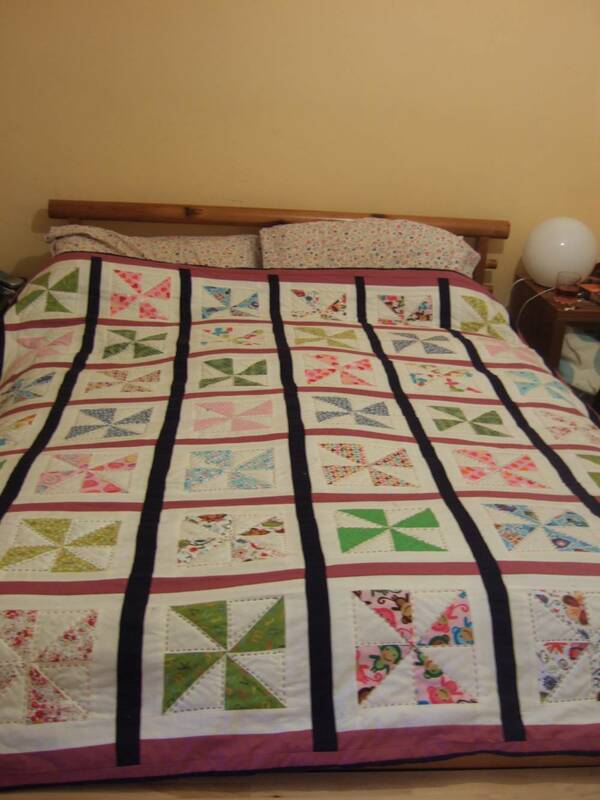 I’ve done numerous patchwork projects but this was the first, throw on the bed, complete quilt with batting, backing and hand quilting. Hand quilt in Perle Cotton the pinwheel design just kind of organically grew as I came across fat quarters that I liked and wanted to try and include. 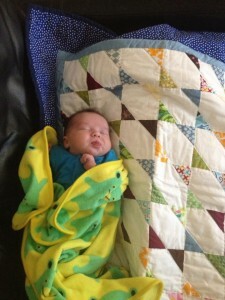 The more recent quilt project was awaiting the arrival of my new nephew Samuel. This quilt block pattern I think is called exquisite star but I think it has many names. I found it whilst interweb browsing for some quilt inspiration. As it was a smaller project I had been hoping to try and quilt it on my sewing machine but it was a bit of a no go, so I ended up hand quilting with the invisible thread instead. When I have some time I do hope to sit down and practice some free motion quilting on my machine. I might try a small project like a quilted cushion cover maybe. A quilt and a fleecey blanket, he’s already a cover hog! I hope to post an in progress report on the stash busting quilt I’m currently working on soon. It turns out that quilt making is really addictive.